Founded in 1820 and located in the leafy Southern suburbs of Cape Town, The South African Astronomical Observatory (SAAO) is the national centre for optical and infrared astronomy in South Africa. Its prime function is to conduct fundamental research in astronomy and astrophysics. It does so by providing a world-class facility to scientists. 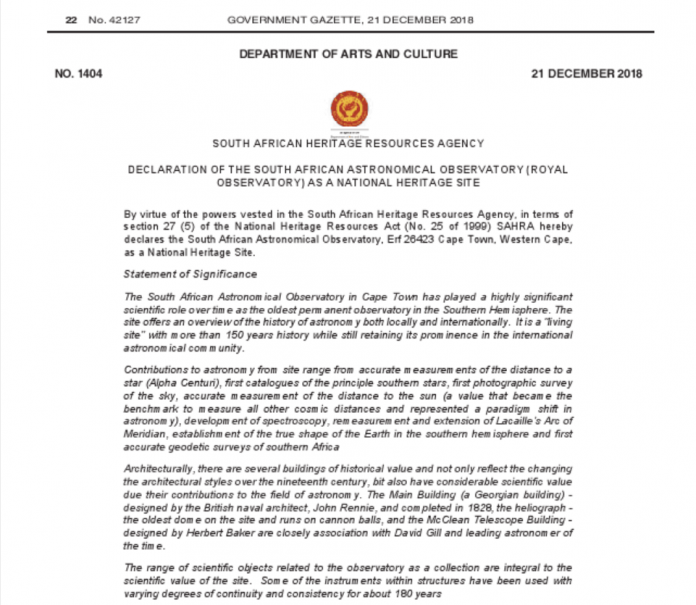 The observatory has been declared as a National Heritage site by the South African Department of Arts and Culture. This was done on December 21, 2018. Click here to visit the observatory page on South African Heritage Resources Agency Website. Architecturally, there are several buildings of historical value reflecting both changing architectural styles over the 19th century and notable scientific contributions to the field of astronomy. The groups of buildings, patterns of planting and routes have intrinsic social, aesthetic and scientific significance and contextual significance in regard to developing an understanding of the two river’s confluence inherited landscape qualities, its history and associated memory. The key buildings on the sites are the south-facing Main Building and the Observatory Building which houses the McClean telescope. The Main building was designed by a British naval architect, John Rennie and completed in 1828. The building is a neo-Classical building reflecting a Georgian and Greek reference with symmetrical with two double storied wings extending to the front with two large windows with detailed surrounds within which it is set. Some of the windows on the wings facing onto the courtyard at the rear were false arising from an incorrect assumption by the architect that a window tax was applicable. The central room initially had a centralised lantern placed there in 1824. To the rear of the main elevation, a square tower now rises upward, currently housing some of the services of the building. Internally the building has retained some of its original fireplaces, teak joinery and two staircases. The McClean Telescope building was designed by Herbert Baker and houses the unique telescope donated by Frank McClean. Next time you visit South Africa, take a visit to the observatory.